Super Paradise Beach is located right next to Paradise Beach and is reachable by taxi-boat (regular boat services are available from Platis Yialos) and local bus. It is considered as one of the most beautiful beaches in Greece. Mykonos Super Paradise is less organized than neighboring Paradise and has beautiful crystalline waters and soft golden sand. Super Paradise is a favorite beach of people from all over the world. Due to its popularity, Super Paradise Beach can get very crowded during peak season. Not a family friendly beach, as naturalists like to hand out here. 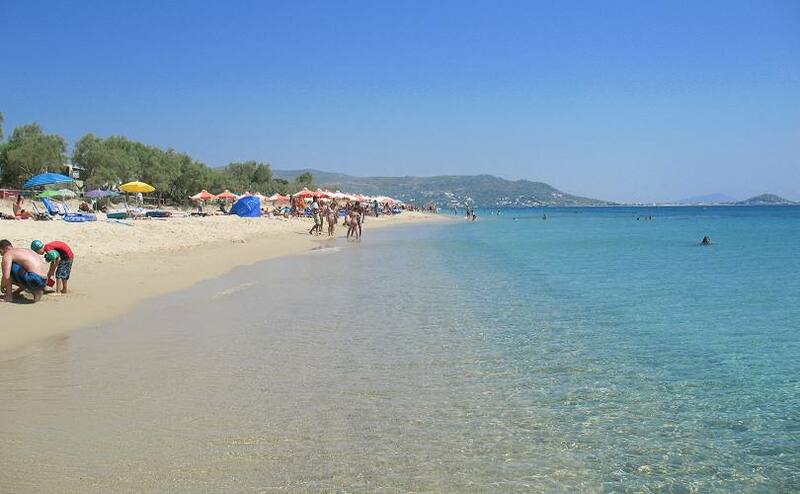 Plaka Beach is like a continuation Agia Anna Beach and is one of the most beautiful beaches of the island. It is a calm and endless sandy beach with, in some parts, big flat stones and amazing crystal clear waters. In the beginning of the beach one can find sun beds and umbrellas but most of it keeps its unspoiled natural beauty, without any tourist facility to disfigure it. A few hotels, restaurants and cafes can be find behind the sandy dunes boarding the beautiful beach. You can also find water sports and windsurfing rentals on this beach. 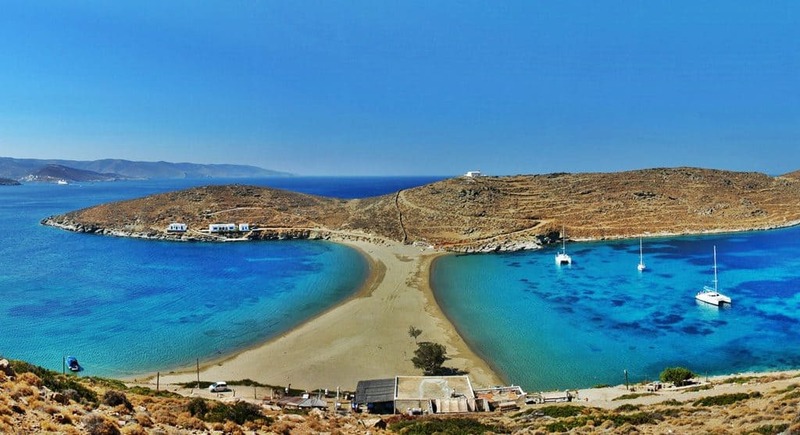 Tsigrado Beach is one of the most beautiful southern beaches of Milos. Located right next to Firiplaka, Tsigrado is a small sandy cove with crystal water. Going down this beach is a bit difficult as visitors have to pass through a rocky passage to get there. The surrounding environment with the rocky cliffs is quite impressive. Mylopotas Beach is located 3 km from Chora. This is the main beach of the island where all tourist action takes place. It is known for its long sandy beach stretching for 1 km and fantastic tourist facilities. Its crystal clear waters are ideal for swimming and the main reason that Mylopotas Beach has been awarded several times with the Blue Flag. The sandy beach is covered with plenty of sundecks and umbrellas offered in low prices and many beach bars where all the action happens. The beach is perfect for a number of activities offering plenty of water sports facilities to visitors, like windsurfing and diving. Despite the tourist development of the area, Mylopotas Beach remains a beach with a beautiful natural landscape. It receives a great number of people all through the day who enjoy the warm sun, sunbathing in the golden sand and swimming in the emerald waters. 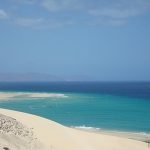 Elia Beach is a huge sandy beach, 10 kilometers from the capital. 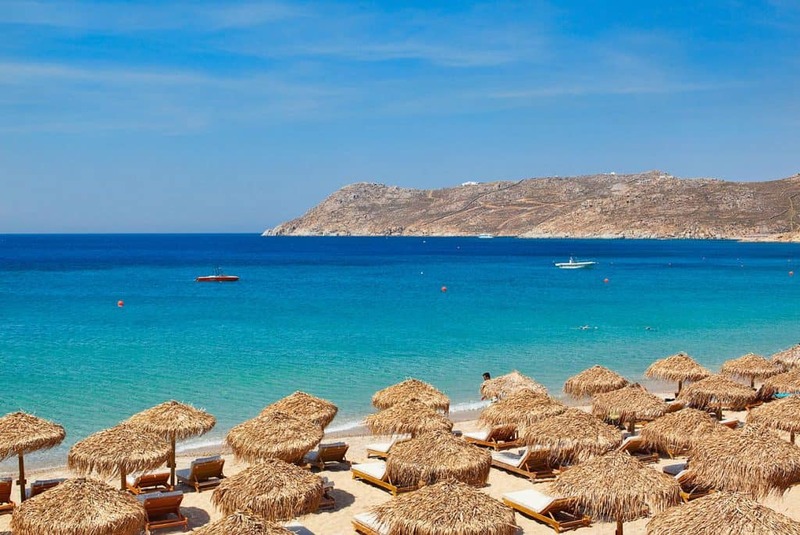 Elia Beach is the longest sandy beach of Mykonos, and offers a wide choice of taverns and bars as well as water sports facilities such as water-skiing, parasailing and windsurfing. 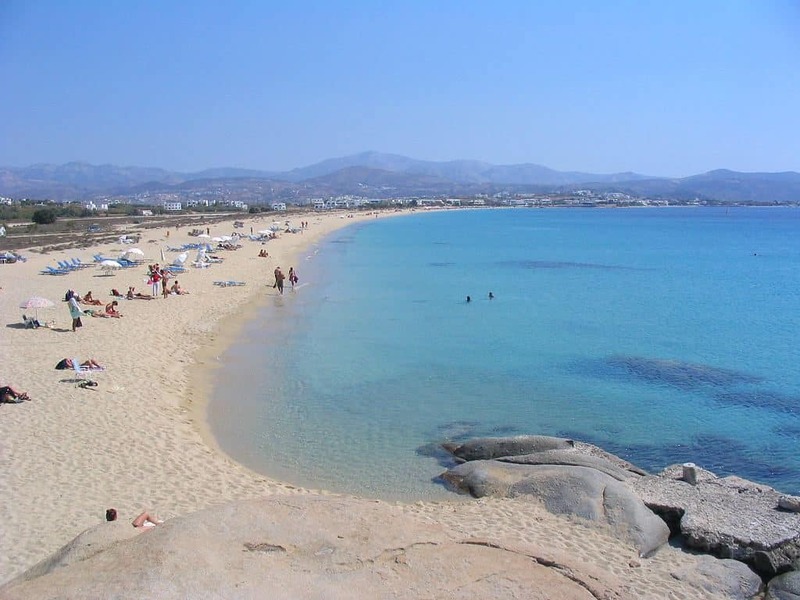 Elia Beach is quieter than some of the other beaches like Super Paradise and Paradise Beach on Mykonos. Don’t take the little ones to this beach as lots of naturalists go to this beach. There is a nice view to the left up the hill, where you can enjoy the traditional Cycladean houses. Here you can find jet ski, water boat, and banana boats for use. 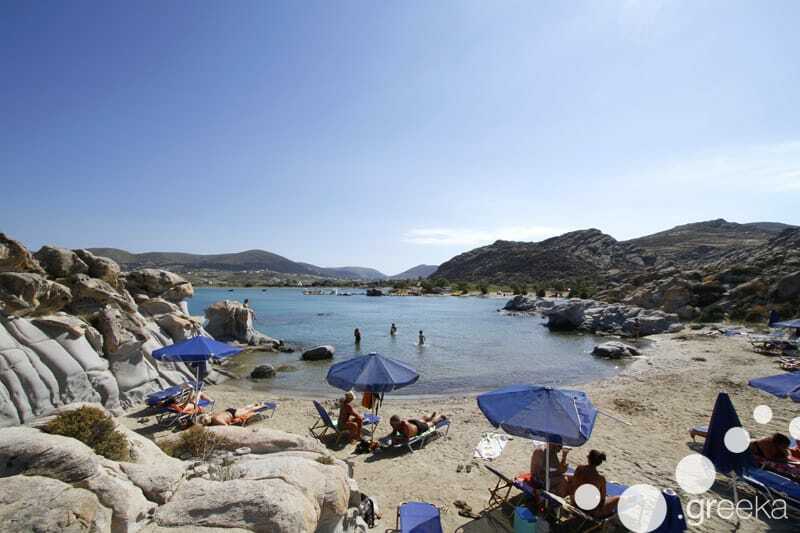 Kolimbithres Beach is one of the most famous beaches of Paros and is located in the huge bay of Naoussa, or Plastira Bay. This beach is impressive because of the huge blocks of granite boarding it, sculpted into strange smooth shapes by the sea and the wind over the centuries. Small sandy coves line the coast one after another, making up the beach of Kolimbithres. Some are lucky enough to have their own private tiny bay. Sun beds and umbrellas can be hired in some areas of the beach and some water sports facilities are also available. A few beach bars and taverns can be found along the road leading to the beach. There is a parking lot above the beach, or you can also take a boat to the beach from the port of Naoussa. This beach also has diving facilities. 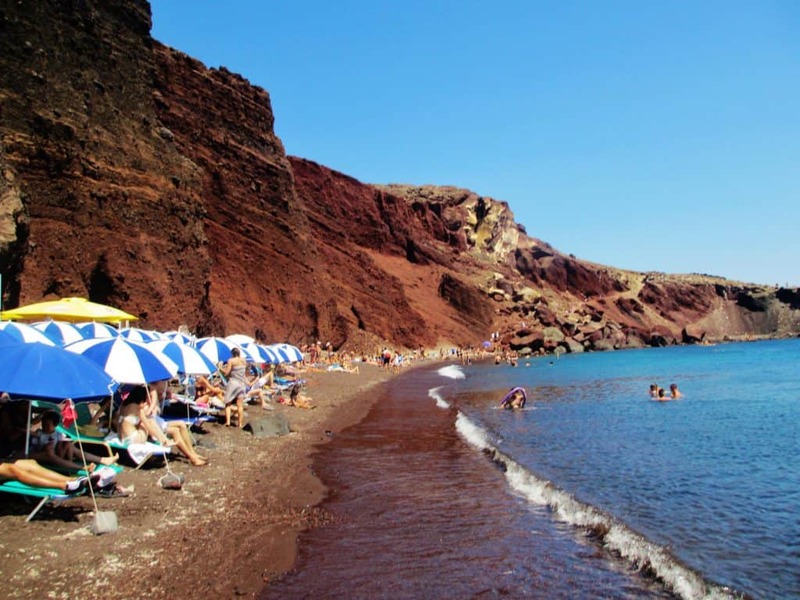 Red Beach is arguably one of the most famous and beautiful beaches of Santorini. It is located only some steps away from the ancient site of Akrotiri. The small size of the beach creates a much crowded atmosphere and there are many days where most of the visitors choose not to make it all the way down to the beach and instead admire this unique landscape of red and black volcanic rocks from the headland. The access is relatively easy. You can leave your car at the parking space and continue all the way down that takes about two minutes. As you gradually get down to the beach you will be impressed by the different colorings of the cliffs. Many sunbeds and umbrellas cover the dark sand and right on the seashore are some nice pebbles you can use for your collection. Snorkeling is highly recommended due to the interesting rocks. You can also access the beach by boat that departs from Akrotiri port. 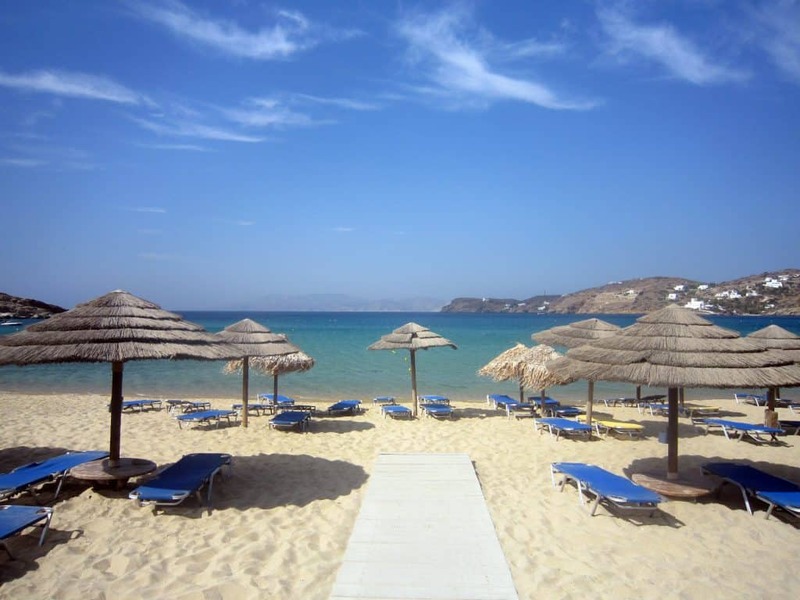 Agia Anna Beach is a beautiful beach located very close to Chora. It is a small rocky beach that is distinguished for its spectacular beauty. Sunbeds and umbrellas are not available at Agia Anna Beach, so make sure to take all the essential items with you. 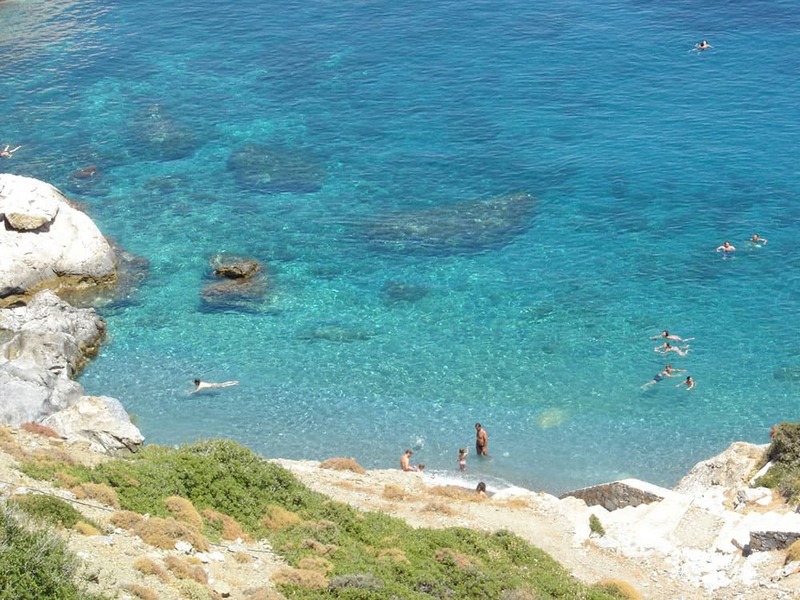 Despite this inconvenience, Agia Anna Beach remains quite the famous beach on the island. Due to its rocky landscape, it might be a little dangerous for children, yet it offers an amazing diving and snorkeling experience in the crystal waters of the Aegean Sea. Agios Prokopios Beach is one of the most popular beaches of Naxos and considered as one of the most beautiful beaches in Greece as well as in Europe. 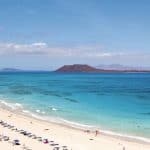 The long golden sandy beach extends over 1, 5 kilometers and has beautiful crystalline waters, protected from the strong winds frequently blowing on the island. 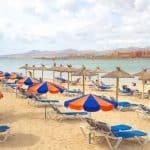 One part of the beach offers sun beds, umbrellas and water sports facilities, while the other part is left to its natural beauty and totally unspoiled by tourist facilities. Sand dunes are softly rising on this beach, and behind them lies a small village with various hotels, restaurants, cafes and bars. Kolona Beach is a narrow strip of land that connects Kythnos to the islet of Agios Loukas. However, it has a particular charm, due to its fine golden sand and the ocean lapping at both of its sides. Kolona Beach is surrounded by gentle, slopes, and is about 3 km to the west of Chora village. This is not a beach to drive to as the road is very rough. Instead take a taxi boat from Merihas, the main port of Kythnos. You will not find any umbrellas at this beach, however there are a few large trees to provide shade. Kolona Beach is noted as one of the most beautiful and romantic beaches. This beach should not be missed when visiting Kythnos Island. Simply stunning descriptions, pictures and video! This one is going on my bucket list for sure. The picture at the very top of the article caught my attention immediately. Something about that blue water next to that amazing architecture with the blue rooftops. All the beaches in the article sound interesting. I think Plaka Beach would be one I would go to if the kids are along and Kolona Beach would be a good one as a get-away for me and my husband. Great Barbra! It is definitely a bucket list item and great choice of beaches as well 🙂 Please let me know if you have any questions, I would be happy to help! Waow! I mean wow! I am glad I have just booked my holiday to go to Spain this year if not I would be very jealous of those picture views right now. 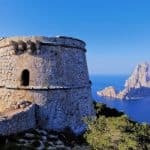 You nearly made me change my mind and go to these holiday spots you mentioned. You got a great thing going here and I bet you in the near future this website will become go-to get information on a hot beautiful place to go for your holiday. Thanks for sharing this. I enjoyed the read. It’s like taking one by the hand and guiding them with images. I will be visiting here often now. I’m glad you enjoyed Richard….you now have a new bucket list item 😀 Thanks for visiting Cyclades Travel. These beaches are really amazing and wonderful. One of the lovely beaches should be experienced by a person in this lifetime. You really did a great job in carefully giving the review of each beautiful beaches and no doubt you have put me in a state of confusion (lol) in choosing where to go in my next vacation. But I would love to visit the super paradise beach Mykonos, in Greece. Having access to taxi boat would be awesome experience. Great job. Hey LeahRae! Thanks for taking the time to put together this Cyclades Travel Guide. The architecture is gorgeous and the beaches look so relaxing. I really like teh coves but I bet they get packed durring peak tourist seasons. What is the climate like in Cyclades? Is it warm all year round and when is the peak tourist time for them? Hi Marlinda and great question. 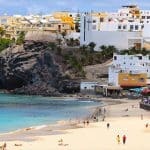 Temperatures in The Cyclades can soar in high season (June to August), but due to the constant breeze which prevails during this time, travelers can feel some relief from the heat. Weather in The Cyclades is very pleasant from mid May right through to Mid October and some may prefer to visit in low season as it is often less crowded. I’m gonna have to say Plaka Beach, in Naxos is the top of the list. It has amazing white sand and does not get too crowded which I like 🙂 Yes, the Cyclades are a great exotic beach destination. I believe that anyone that loves beaches, needs The Cyclades on their bucket list! I love Cyclades! I visit the islands every year. Your article helped me choose this years’ destination: Kythnos. Are you planning a similar article on Dodecanese ??? Yes I am Effie and wow, how nice to visit there every year! You are very lucky! Thanks for visiting my Cyclades Travel post! Wow, Agia Anna beach is the best for me among all other superb beach destinations you have shared. I would love to go there. I have two kids though could be a great holiday for me and my husband only. We will definitely go leaving kids to their grand parent for some days. Hi!! You have no idea how much I’d like to go to a nice beach especially these days and looking at these beautiful beaches makes me want to go even more! I absolutely love Spain. I’ve been years ago and I found it gorgeous! Beautiful beaches and a lot of fun. I’d love to go back there and actually do a tour so I can visit also other beautiful spots around that area. Thank you for the great info! So glad you enjoyed reading! Yes, as you can tell I love beaches too! I don’t know why I keep on looking at your website. It is giving me serious travel envy. I need to stop looking at all these beautiful places that I can’t afford! Anyways, my mother and sister both went to Greece (without me 🙁 ). 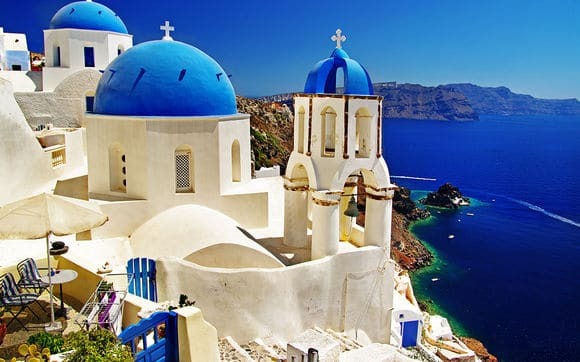 I’m pretty sure they went to the Cyclades Islands. The pictures look really familiar. I’m going to Rio in the spring. Any beaches you would recommend there? Yes, I will actually be doing a review on Rio beaches. I will do it next just for you 🙂 Thanks for visiting Cyclades Travel! This is great information about the Cyclades. The pictures and videos really speaks a lot about the beaches. Your descriptions are also helpful. This makes me want to visit the beaches in the future. The islands all look like great places to travel during my vacations. This can help me make decisions on what beaches I should go when I travel to the Cyclades island. I hope you can make it there soon Fay. Thank you for visiting some of the best beaches in the world! Man these pictures look absolutely gorgeous. It feels almost like it’s too good to be true. Curious question, have you been to any of these places? What’s your personal favorite travel destiny or beaches? I personally love to travel and would do it a lot more if I could. But as soon as I can there are so many places I’d like to see. Of course I’m not as big on beaches, but there’s plenty of excitement to be found there. Like surfing for example. I love your website! It’s very informative and easy to read! There are a lot of useful tips on beach gears, including where to buy them and why they are essential! It also covers a lot of information on beaches in the US that I have never been to!! It’s really useful for planning my next trip to the beach! Well done! Thank you so much Chelsea! I am glad you enjoyed visiting Beach Travel Destinations. If you need any help planning your next beach vacation, please let me know! Your post Cyclades Travel really caught my eye and imagination in record time. What a gorgeous first picture, I instantly thought Greece and I have never been yet. The beaches look so pristine and the glow of the blue from the water is spectacular. I am wondering, in order to spend a few days on some of these islands when would be the best time to visit without all the other tourists. I guess we like to travel during off-peak times. The best time to avoid the large crowds is going to be April – May and October – November. November to April has few crowds too, but it is rainy and less services are open, so you might not enjoy the trip nearly as much. I am really glad you enjoyed reading about Cyclades beaches. 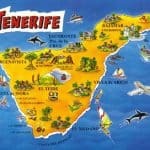 They have a lot of really great beaches, some of the best in Europe! Definitely visit April – May or September – October. It will not be as busy, yet it will be nice. Thank you for visiting! Glad you enjoyed reading about some of the best beaches in Europe! Hello! I really like your website. It feels more personal, if I compare to many others, and the description of your destinations and beaches are awesome. You are truly offering everything I need in a vacation. 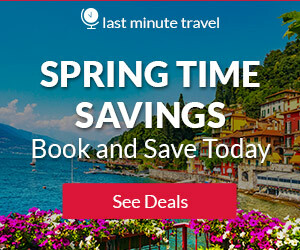 I will definitely use your suggestions and book my next travel trough your website. I hope so Patrik 🙂 I am very good at finding the bargains and getting you the best deal. Thank you for your praise of my website and for visiting Cyclades travel. They do have some of the bests beaches in Europe!